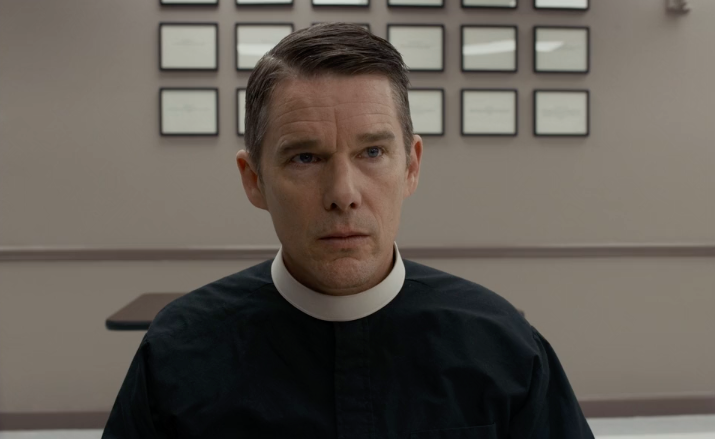 In the opening moments of Paul Schrader’s First Reformed, the camera slowly approaches an immaculate, white-steepled church, symmetrically framed by well-trimmed topiary and threatened by an overcast sky. As subjects enter that frame, and a narrative takes shape, the boxy aspect ratio frames a landscape most recognizable in the stonewashed color palettes and somber, studied postures of a Whistler painting. Here we are in middle America, 2017, and here we are, too, in the stoic and enduring hinterlands of Protestant morality. First Reformed is the most recent in a stream of projects that features the Hollywood establishment wrangling with their projections of Trump country, territory which is quickly becoming the uncharted frontier of the liberal imaginary. Schrader’s latest venture invites us to take a look into the tortured and guilt-ridden psyche of Reverend Toller (Ethan Hawke), a solitary clergyman who lost his son in the Iraq War and who subsequently becomes embroiled in the violent eco-terrorist politics of a parishioner. It’s an earnest and self-conscious concoction of prototypically American toxins, an ideal breeding ground for the kind of troubled pageant that routinely garners the most Oscar buzz. The audience gets a healthy dose of thwarted white masculinity, the corrupt infrastructure of the Christian establishment, endemic passivity towards the threatened environment, and the anguish of a nation forging ahead on fundamentally unstable ground. At every turn, Schrader takes pains to weave elements of contemporarily relevant political discourse through the narrative of the film, but these efforts do nothing to counteract the sense that the film’s premise and subject are old; hackneyed relics of mid-century American auteur cinema. Schrader declines to investigate the complex and intersecting factors which have caused Protestant America to feel left behind, and he more stubbornly brushes aside the challenge of representing the populations upon which their historical dominance had been predicated. Instead, First Reformed deploys a host of Protestant self-punishing trappings and conventions to fabricate a seductive spectacle out of white male guilt and self-pity. Schrader has been interested in the narrative of the impotent male figure struggling for power and relevance since Taxi Driver, and the tormented hero of modern America he envisions in this self-flagellating excuse of an activist is no exception. Throughout the film, the reverend’s self-denying and negligent proclivities escalate to large-scale violence, fueled by the whiskey and Calvinist ideology that Schrader elevates to mythological status in his exploration of American sin and transgression. And of course, his generous sympathy for– and dogged focus on–the figures of Reverend Toller and the eco-terrorist Michael (Philip Ettinger) is not extended to the rest of the overlooked population of this prototypical town. The depiction of women tilts from puzzling to alarming; the most prominently featured female character, earnestly christened ‘Mary’, is played by a wide-eyed and one-dimensional Amanda Seyfried, who annoyingly takes the standard double form of naive sexual temptress and pregnant vessel laden with symbolism of civilizational hope and regeneration. Her counterpart, the sexually and emotionally needy Esther (again, Schrader loses no mileage in Biblical naming opportunities) is bookish and studious; Reverend Toller gleefully unleashes his pent-up aggression on her as he grows into the potence of his masculine violence. It’s a trope as old as the cinematic canon; the audience is coyly invited to condemn the tortured male protagonist for his transgressions, but the voyeuristic appeal of recapturing control of the lost male domain never ceases to be ripe for cinematic exploration. This is a story we have seen, in Schrader’s own work, and in the work of his peers, countless times. Auteur and indie cinema cultures were fed on this spectacle; even now, on the big screen and the small one, the displaced (white) male protagonist continues to muddle his way through the same crises of faith and purpose. Several decades on, he still struggles to adapt to changing roles in society, leaving casualties strewn about in his wake. These films have held center-stage long enough. Let’s change the conversation. Written by: Madeleine Collier on July 21, 2018. Last revised by: Double Exposure, our reviewer, on October 8, 2018.